Concrete floor is without any doubt a bold, dramatic and super contemporary foundation in the bedroom interior. Concrete floor in the bedroom, regardless if polished or rough can transform the outlook of a traditional and simple bedroom into bold and contemporary interior.Concrete floor in the bedroom is the perfect solution for everyone who strives to attain an unique, vibrant and dramatic appearance of the interior. Besides, the concrete floor it’s the hot trend in the interior world, so if you are following trends, this may work as a revelation in your bedroom. This is also a great idea if you are thinking about renovation and you want to boost up the dynamic and modern outlook of the bedroom. Check out the below showcase of 20 Bold Bedrooms with Concrete Floor and enjoy! The minimalist setting in combination with the neutral color scheme perfectly adapts the polished concrete floor. The concrete floor against the white color scheme creates a high contrast and truly modern and charming ambiance in this beautiful bedroom interior. The advanced architecture of the attic walls in combination with oak platform bed stands just wonderful on the bold polished concrete floor. The low window illuminates the concrete floor and brings the bold and natural perk of the bedroom. This is a perfectly decorated Eco inspired bedroom with polished concrete floor, rough bulky concrete posts with noisy surface and amazing glass wall that sets the impressive and bright appearance of this natural and beautiful bedroom. The dark polished concrete floor surely sets the dramatic and super contemporary foundation in the overall modern and architecturally impressive bedroom. The oak wood paneled contrasts the dark concrete floor, therefore creates the balance in the utterly chic and cozy bedroom interior. This white bedroom is utterly bold and dramatic. The concrete floor with utterly noisy surface along with the concrete platform of the white bed sets a truly modern and awe inspiring ambiance in the chic white bedroom. We love the effortlessly cool and industrial charm of this beautiful and cool bedroom. The concrete floor sets the industrial chic foundation and perfectly break through the plain white walls, providing the bedroom with dynamic and vibrant ambiance. The concrete floor perfectly adapts the all industrial gloom of this bedroom interior and contributes to the modern and contemporary appearance of the bedroom interior. The clean surface of the concrete floor creates dynamic and neat outlook of the interior. Rough concrete floor is perfect for creating an effortlessly boho chic appearance of the bedroom interior, as you can conclude by yourself from the example above. The painted white brick walls bright up the gloominess from the concrete floor and therefore this bedroom has attained a perfect balance and modern appearance. The natural and bright appearance of this Eco bedroom is due to the bold and tall glass wall and the presence of the neutral color scheme enhanced by the bold and dramatic concrete floor that brings the vibrant and dynamic perk in the bedroom. Some bedroom just know how to pull of the super gloomy appearance of the interior, which is the case with this beautiful gloomy and charming bedroom. The trim wooden panels contrasting the concrete floor has provided the bedroom with natural and dramatic ambiance. This is one bold and unique bedroom, right? The concrete floor matching the concrete ceiling makes an industrial and modern statement in the overall chic and modern bedroom. The dark wood canopy bed creates a bold visual and contributes to the dramatic and bold appearance. The sleek surface of the concrete floor creates a truly bold and contemporary ambiance in the gray and smoky bedroom with masculine charm. The creamy motifs eased down the heaviness from the concrete and provide soft charm in the interior. We love this bedroom, it’s totally contemporary and awesome. The combination of light oak wood bed and contemporary steel and wood bench provide the bedroom with contemporary and modern appearance, while the concrete floor set an industrial and dramatic ambiance in the interior. 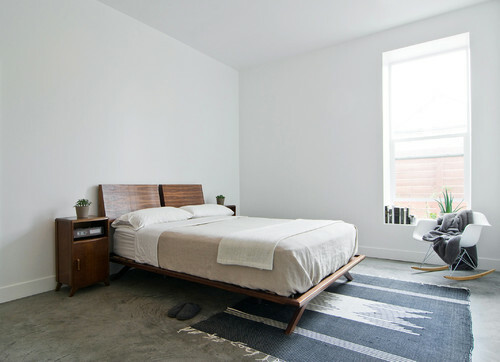 This bedroom has not only pulled off the dark concrete floor awesomely, but also holds a blend of rustic, minimalist and contemporary which is perfectly arranged by the plain white walls, reclaimed wood shelves and low positioned window. Just Perfect! The Scandinavian bedroom with concrete floor has a truly airy and modern appearance due to the minimalist setting and the high contrast between the floor and the white walls. The creamy and beige tones perfectly adapts the concrete floor of this elegant and classy bedroom. We love the merger of classy beige color scheme and industrial concrete floor which create the bold and balanced ambiance of the interior. The drama in this bedroom is just exceptionally bold and vivid! The play between dark concrete floor and canopy bed with linen white curtains sets the balance and provides the beautiful bedroom interior with outstanding charm and splendid perk.